The Brixham British Legion Band was first formed in 1927. 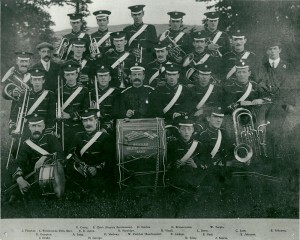 Before this time there were two bands, firstly the Brixham Excelsior Band which existed previous to 1911, we have a photo taken during that year with names of members printed underneath. 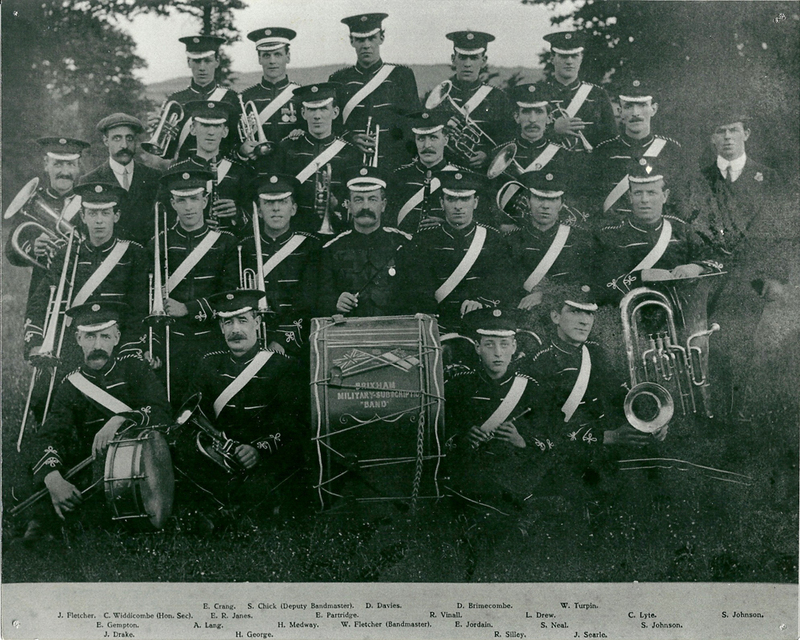 Secondly another band, of which we also have a photo, was the Brixham Military Subscription Band this was in existence in 1914, when this photo was taken. We believe that this band was the forerunner of the present Brixham Royal British Legion Band. The Bandmaster of the Brixham Excelsior Band was at one time a Mr Cauley. A granddaughter of whom tells us that several of the family played in that band. The Military Subscription Band was conducted by another Brixham man called Bill Fletcher, who several of the retired members can remember. We do not have many details of the early days of this band except for information given to us by older retired members and their relatives. One such member can recall joining the band in 1928 at the age of seven years. ln those days the band used to play outside the Town Hall on Saturday evenings and we are told by another member that the crowds used to form six deep around the Bolton Cross to listen to the band and chat about the Brixham Rugby and Brixham United matches which took place the same day. Before the Second World War the British Legion Band used to rehearse in a room which we believe at one time was used as a trawlers sail loft and stores. These premises were situated near Bump Street on land now called Beach Approach. After their Saturday evening performance s at the Bolton Cross the band would carry their instruments back to the band room. The Bass Drum was then laid flat on the floor and the collection boxes were tipped out on the drum and the money was counted out. This same bass drum is now on view at Brixham Museum. The son of a tenor horn player, called Tom Tucker. tells us how as a boy he used to collect for the band and as a reward he used to be given the odd coppers for helping. Another young man now in his seventies can recall going in the Conservative Club with a collection box, he was always looked at suspiciously and was told by club members to keep his hands out of the box. Apparently they didn’t trust him. this young man was Ernie Criddle.